Product roundup When Apple changed its longstanding 30-pin iPod connector to the Lightning interface, an industry died. The ubiquitous iPod dock – that for years had appeared on just about any piece of consumer audio gear – was no longer a necessity and with more Android users out there than ever before, only a few manufacturers would offer a Lightning dock alternative. Indeed, as mobile phones have replaced PMPs, docking doesn’t come into play any more and that shift has seen the option to use Bluetooth wireless streaming for audio interfacing instead. While Bluetooth speakers have been in abundance for some time, this year has seen a much more satisfying marriage of the DAB radio offering Bluetooth connectivity. Start looking and you’ll notice them everywhere. Besides being handy to play your own tunes over Bluetooth, there are numerous Internet radio apps for phones and tablets, that can be played to this kit too. 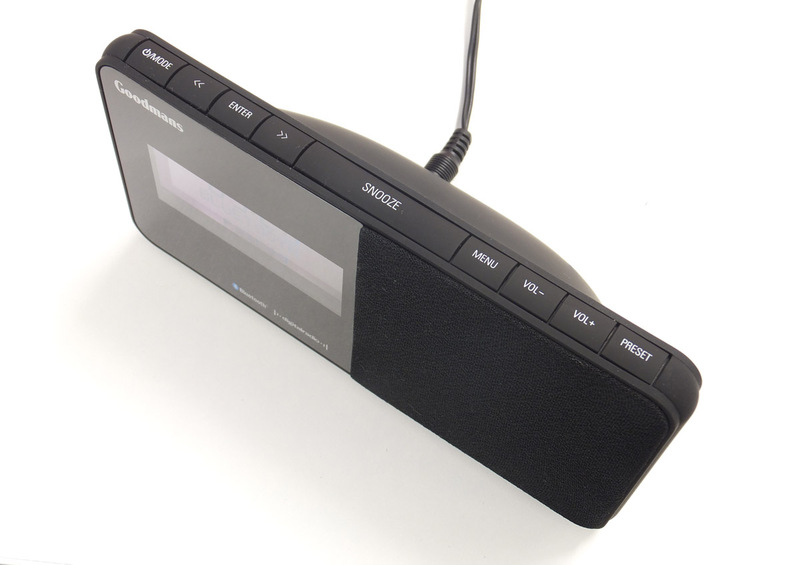 Sure you need to have your mobile tech within proximity of the DAB/Bluetooth radio, as Bluetooth isn’t the most robust of wireless communications, but it does mean you can avoid shelling out extra for Internet connectivity on the radio itself. We’ve gathered together some of the latest of these combos all featuring Bluetooth 2.1 or higher, DAB and FM radios. In all cases, Bluetooth pairing was achieved in seconds with no need to enter passwords or codes. Apart from the DAB Goodmans and Sandstrom models, all receivers were DAB+ but none had LW or MW bands on board. However, they all featured aux inputs so you can attach your crystal set if needs must. Radio tuners aside, to see how well these combos performed with Bluetooth we tested them all out with Android (Motorola Moto G), iOS (Apple iPhone 4s) and Windows Phone (Nokia Lumia 820) to find out whether you should be making shelf space for a new wireless, wireless this Christmas. This DAB-Bluetooth combo radio is unmistakably designed for bedside use with its Bluetooth pairing functionality being a bit of a bonus. You won’t find DAB+ on here as it’s DAB only but this, along with the FM receiver, can be configured with 10 presets each. Apart from the bulge around the back, face-on it’s about the same size as a large phablet. Connectivity is well catered for, featuring a USB charging port, headphone and aux input sockets – it even comes with a minijack connecting cable to hook up external audio gear, which is a very handy addition. The control buttons are all along the top with a big snooze bar in the centre. Switching modes and pairing for Bluetooth were simple enough to manage with repeated prods, but the lack of any dial does mean that cursor keys take on scrolling duties. Until you get the hang of the various menu layers, you’ll be making tiresome mistakes as you cue up stations to store as presets. Thankfully, none of this takes too long to work through. For the most part, the navigation is intuitive, although on occasion these firm, rubberised buttons appeared to need additional presses, but often it was actually due to a slight delay in processing tasks. The intuitive poking doesn’t sustain into the two separate alarm settings though. Anyone using this as an alarm clock will need to take a look at the manual, as there are a few tricks that need to be observed that you’d never fathom without knowing the user guide clues. If you’re in a challenging reception area, you’ll need to experiment with the wire aerial positioning to avoid babbling brook moments on DAB and FM interference too, but it wasn’t especially troublesome in tests after a bit of fiddling. The 2in speaker driver isn’t going shake the room but it’s loud enough to wake you up and while bass isn’t exactly high on the menu here, the overall output at its sober maximum volume is perfectly acceptable for its bedside duties. 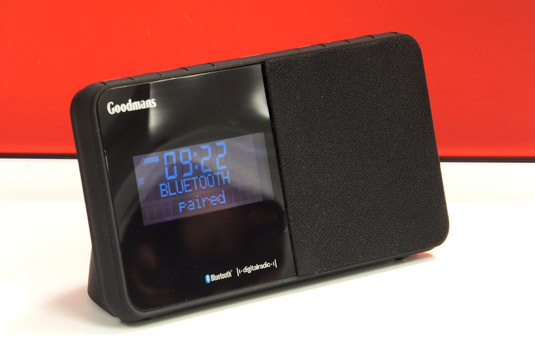 Lest we forget that this receiver does function in stereo from the headphone output, so if you were keen to get a cheap DAB-Bluetooth unit to hook up to a beefier stereo system, you could get away with it using this Goodmans clock radio. I know, the audiophiles out there are cringing at the thought, but hey, it works and on-line you can find this for under £50 which is what many are charging for some dumb Bluetooth streamers alone. 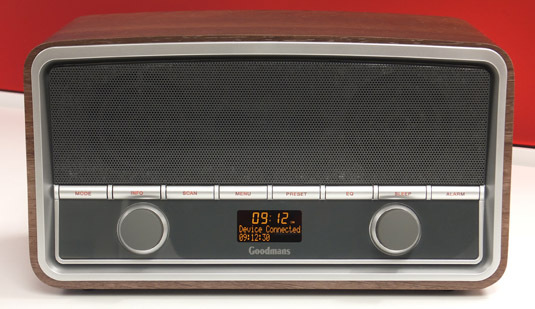 As retro radios go, this Goodmans certainly makes a statement not only with its styling and wooden enclosure, but its sheer size. This is one for granny’s sideboard and she wouldn’t find it too much of a challenge to operate either. The row of buttons spanning the breath of the front fascia gives it looks akin to a giant car radio from a 1950s American classic auto. The only quirk being the unlabelled knobs – press the one on the left for power and rotate for volume. The one on the right handles Menu scrolling with a press for selection. Among the buttons is one for EQ which has a selection of presets and a custom EQ set-up which is a combination of bass and treble tweaks together with a loudness option that delivers a more in your face sound. While not particularly subtle, this palette of tonal colouration is definitely worth having. Digging around the menu reveals some other differences to models on test here. The FM scanning has detection options for Strong and All Stations, however, your mileage will vary depending on the amount of interference, but the Strong setting is definitely handy if you’re adding a few local FM favourites. The unimposing LCD provides helpful at-a-glance details with more esoteric DAB information accessible with repeated prods on the Info button. There are two alarms and a sleep timer, but it lacks a dedicated snooze button. Round the back is interfacing for the headphones and an aux input but no USB charging or firmware updating port. 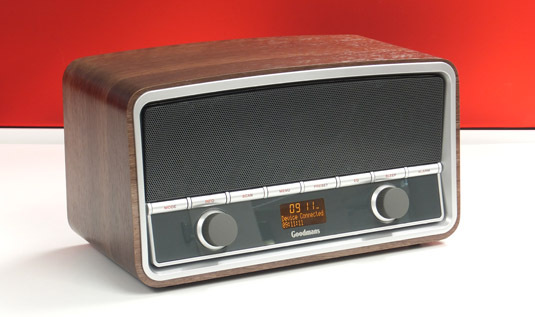 Alas, this is a DAB-only radio rather than DAB+ but granny might not be around when they finally phase out DAB, so you can buy with confidence. And indeed you can as this receiver has stereo speakers that belt out 2 x 10W, so if it’s volume you’re after, this model delivers. It’s one of the best sounding too as its size and shared sonic duties over two speakers seem to give it less of challenge at higher levels than some of the bookshelf alternatives have to grapple with – and don’t forget those EQ options as they can add a bit of spice to lacklustre mixes. Also available in white, if you don’t need a compact receiver, then the Goodmans Heritage makes an impact both audibly and visually.